New statistics from the ONS, show that there are large disparities in wealth within the UK. In 2010/12, aggregate total wealth of all private households in Great Britain was £9.5 trillion, (increasing from £9.0 trillion in 2008-10. The wealthiest 10% of households owned 44% of total aggregate household wealth. The poorest 50% of the population only have 9% of total wealth. Half of all households had total wealth of £218,400 or more. In 2010/12 the wealthiest 20% of households had 105 times more aggregate total wealth than the least wealthy 20% of households. In comparison, in 2008/10 the wealthiest 20% of households had 92 times more aggregate total wealth than the least wealthy 20% of households. The report doesn’t capture wealth in offshore havens. The most wealthy group are those around retirement age (55-64), with no children. Total wealth net property wealth, net financial wealth, physical wealth and private pension wealth. 48% of households had an individual savings account ISA. The average rise in England was only 6%. 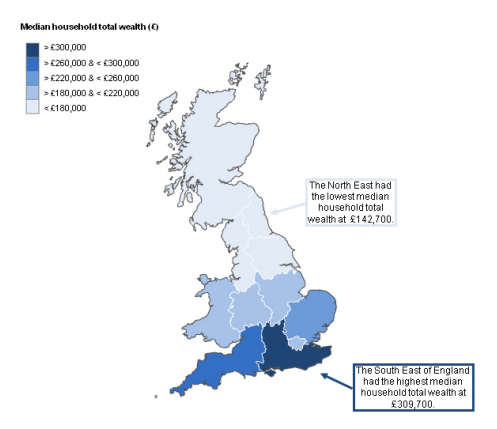 Wealth in the north-east had fallen to just under £143,000. London had the biggest increase in household median wealth with a 31% increase. The closer the curve is to the line the greater the equality of distribution. Financial wealth has the greatest degree of inequality. Pension inequality. In recent years, richer households have been able to increase their private sector pension contributions. 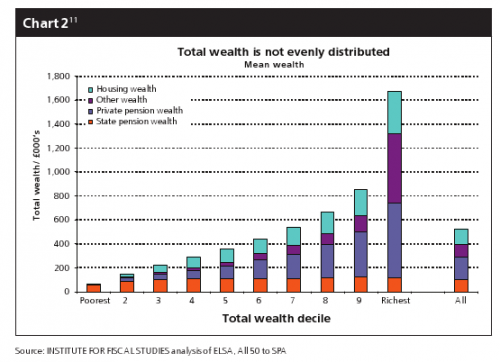 (Private pension wealth makes the largest contribution to total wealth for the wealthiest 30 per cent of households.) The increased importance of pensions has occurred despite poor stock market returns reducing the value of some pensions and asset trusts. 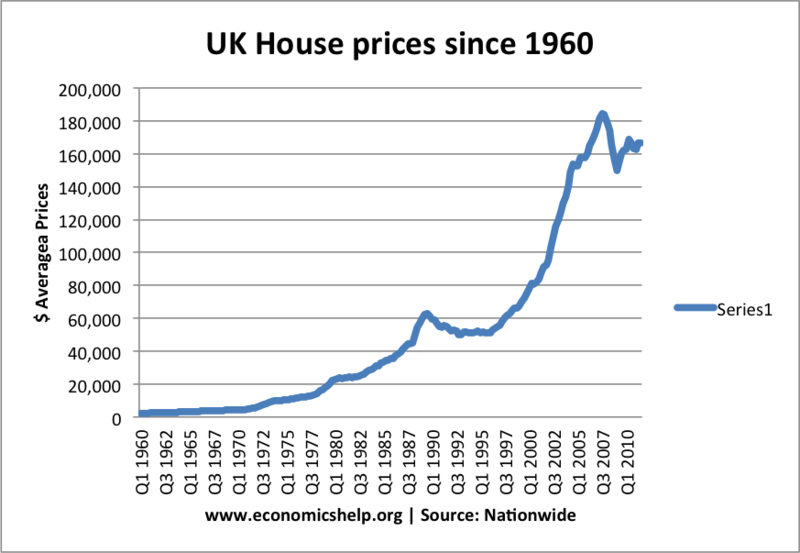 Since the 1960s, UK house prices have increased much faster than the rate of inflation. Property owners have seen a marked increase in household wealth through rising property prices. This has increased the gap between property owners and non-property owners. This has also been exacerbated by the growth of second homes and buy to let which enables households to develop a property portfolio. Ability to save. People on low income rarely have the ability to save. They have a very high marginal propensity to consume. People on higher incomes have a lower marginal propensity to consume, after buying necessities, they have an ability to save (e.g. for private pensions and personal savings account. Thomas Piketty in his book Capital in the Twenty-First Century has argued that the rate of returns on capital (property, asset investment) has consistently been greater than the returns from economic growth. This means that returns from wealth is greater than growth in real incomes. This causes wealth inequality to widen, and he notes it has been a feature across the developed world in the past 20 years. Wealth inequality varies throughout different regions. Because London property prices are higher than the national average then wealth inequality is much greater in the capital. According to In Injustice: Why Social Inequality Persists published by Policy Press, Danny Dorling. Net financial wealth = gross financial wealth – financial liabilities. Gross financial wealth is the sum of formal financial assets (not including current accounts in overdraft) + informal financial assets held by adults + children’s assets + endowments for the purpose of mortgage repayment. Financial liabilities are the sum of arrears on consumer credit and household bills + personal loans and other non-mortgage borrowing + informal borrowing + overdrafts on current accounts. This entry was posted in economics and tagged inequality. Bookmark the permalink. ← Does a trade war cause a recession?